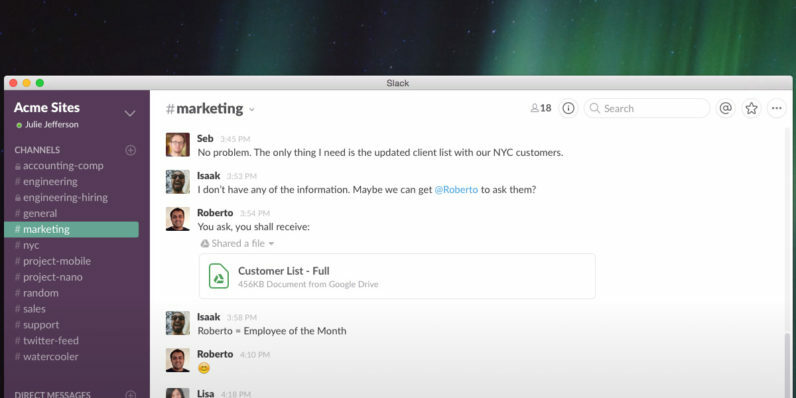 Over the past couple of years, Slack has hogged the spotlight in the team messaging space. Following its achievement of 3.5x user growth in 2015, the three-year-old company raised a total of $540 million in funding, with its last round bringing in $200 million at a $3.8 billion post-money valuation. It’s not surprising that Microsoft, which has been doubling down on productivity apps and services since Satya Nadella was named CEO in 2014, wants a piece of that pie. MSPoweruser reports that the Redmond giant is now working on Skype Teams, a group chat app for businesses that ties in with its Office 365 suite. As with Slack, Skype Teams will feature channels where multiple users can chat publicly.t will also support direct messaging, as well as threaded conversations – something Slack sorely lacks. That should make it easy to follow and participate in discussions without having to create a separate channel or group message. The app will also allow for sharing notes and files, as well as making group video calls and scheduling online meetings. It will also integrate with Microsoft services like Office 365 and OneDrive. Plus, it’ll support Skype’s Bot framework to allow developers to easily extend the app’s functionality with their own services; there’s also a ‘Fun Picker’ that lets you find and add Giphy GIFs, memes and more to your conversations. With that, Microsoft could have a fair shot at winning over business users who are looking for a group communication solution. It isn’t clear when Skype Teams will launch or how it will be priced; MSPoweruser notes that it will likely become available to Office 365 subscribers before it’s opened up to the public.